American smartphone user growth may have slowed in recent months, but the adoption and ongoing use of software apps continues to rise. comScore released summary data on key trends within the U.S. smartphone industry for November 2013. Apple ranked as the top smartphone manufacturer with 41.2 percent OEM market share, while Google Android led as the number one smartphone platform with 51.9 percent platform market share. 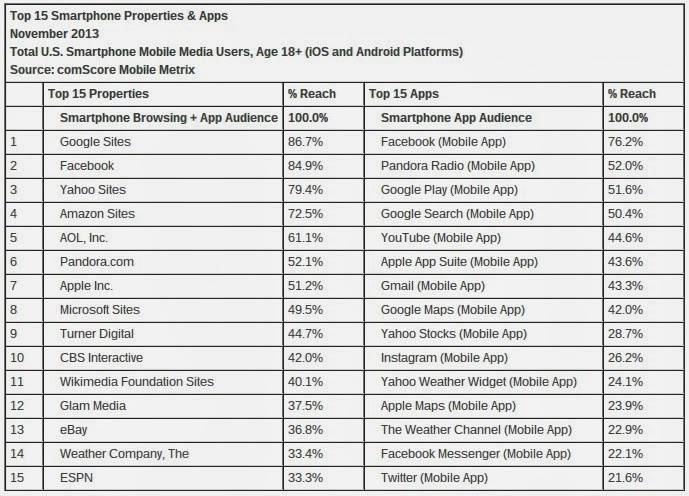 Google Sites ranked as the overall top mobile web media property, while Facebook was the top individual software application. 152.5 million people in the U.S. owned smartphones (63.8 percent mobile market penetration) during the three months ending in November -- that's up 3 percent since August. Apple ranked as the top OEM with 41.2 percent of U.S. smartphone subscribers -- that's up 0.5 percentage points from August. Samsung ranked second with 26 percent market share (up 1.7 percentage points), followed by Motorola with 6.7 percent, LG with 6.5 percent and HTC with 6.4 percent. Once again, Android ranked as the top smartphone platform in November with 51.9 percent market share (up 0.3 percentage points), followed by Apple with 41.2 percent (up 0.5 percentage points), BlackBerry with 3.5 percent, Microsoft with 3.1 percent and Symbian with 0.2 percent. 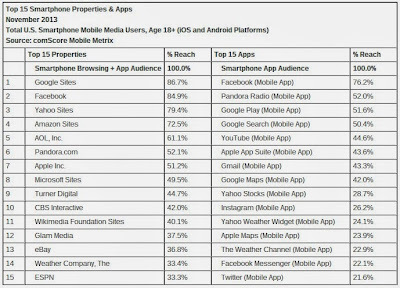 Google Sites ranked as the top web property on smartphones, reaching 86.7 percent of the mobile media audience (mobile browsing and app usage), followed by Facebook (84.9 percent), Yahoo Sites (79.4 percent) and Amazon Sites (72.5 percent). Facebook ranked as the top smartphone app, reaching 76.2 percent of the app audience, followed by Pandora Radio (52 percent), Google Play (51.6 percent) and Google Search (50.4 percent).